Located just outside of Santa Cruz’s bustling city center, the Inn at Pasatiempo (www.innatpasatiempo.com) makes a good home base for a California Coast butterfly excursion. 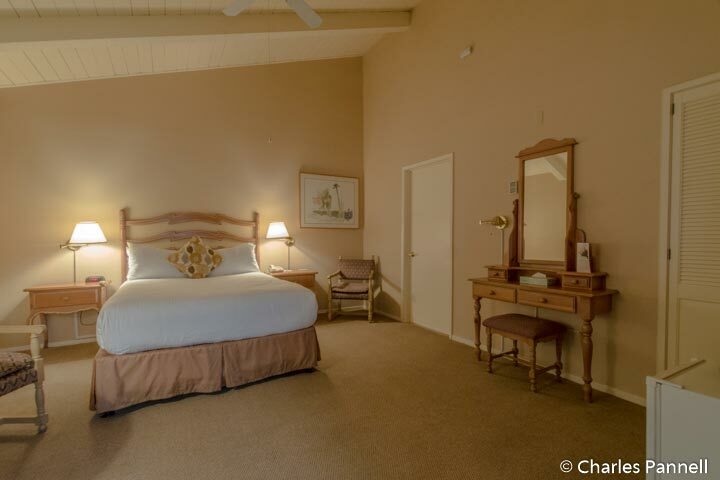 Not only is it close to the Santa Cruz overwintering sites, and just a 45-minute drive from Pacific Grove; but this 54-room boutique hotel also offers good access at a very reasonable price. Located off of Highway 17, the Inn at Pasatiempo features accessible parking next to the lobby, with level access to the front door. Inside, there’s plenty of room to maneuver a wheelchair to the front desk, or over to the cozy fireplace. Accessible Room 201 is located just a short drive from the main lobby, and it has a large accessible parking space in front of it. There’s level access to the oversized room, which features wide doorways and ample space for a wheelchair or scooter. The room is furnished with country-French furnishings, while the windows are adorned with cheerful white shutters. It boasts a 26-inch high open-frame queen-sized bed, two night stands, a small table and two chairs, and a vanity. It also comes equipped with a refrigerator and a coffee maker. And although the bed was a little soft for my liking, there’s wheelchair access on both sides if you move the small table and one chair on the left (as you face the bed). The bathroom has a full five-foot turn-around and is outfitted with a roll-in shower with grab bars and a hand-held showerhead. 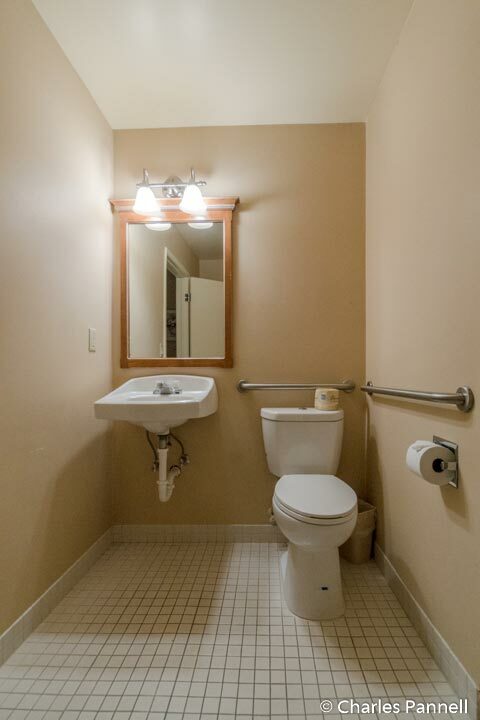 The toilet grab bars are located on the back and left walls (as seated), and the bathroom is equipped with a roll-under sink. 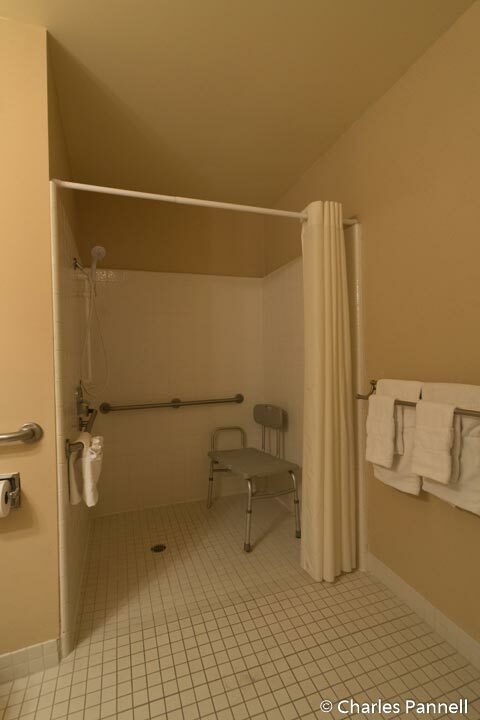 A portable shower chair is also provided, to round out the nicely accessible bathroom. There’s barrier-free access to the public areas of the property, including the Back Nine Grill, which is located just off the lobby. The bar and grill serves a good selection of pub fare, and offers a nightly happy hour. And although some manual wheelchair-users may required assistance up the slight grade to the office from the accessible room, there is also an accessible parking place next to the entrance if you’d like to drive over for dinner. Coffee, pastries and fruit are also available in the lobby every morning. Bottom line – the guest room is nicely accessible, however the pathway access to the office could use a slight improvement. Still, it’s a very affordable property, and the access features in room 201—especially in the bathroom — are certainly very well done. It will definitely meet the access needs of most people.